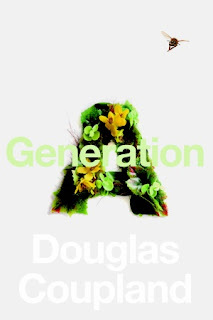 What can I say about Generation A by Douglas Coupland ? It was...different... interesting. I'm still letting the story slosh around in my mind. So what is Generation A about? It's the near future and all the bees have disappeared. This has terrible global consequences, as you can imagine. A fresh apple is a rare and expensive thing. When 5 young people are stung by bees in different parts of the world, they become the the subject of world wide interest. Most of the book focuses on the 5 characters reactions to the events that occur during and after being stung. The story is told in the first person of each of the B5s (as they come to be known): Harj, Zack, Samantha, Diana and Julien. Coupland does an excellent job of giving each of them a distinctive voice. I felt like I really got to know them. If I had to pick a favorite, it would be a tie between Harj who is so funny and clever and Diana who has Torettes and a no-holds-barred way of speaking her mind. As the novel, progresses the characters start telling stories, revealing to the reader their state of mind and how they see the world they live in. A world of technology, cheap drugs and disconnection. I enjoyed most of these stories; some were ironic, some depressing, some funny. The book got weird toward the end. Although I haven't read any other Coupland, I have seen his short lived TV series J-Pod and weird seems to be his thing. I'm on the fence about whether or not I love the book. I certainly was engaged in the writing, which was excellent. The characters felt like real people. The only difficulty I had is the end. I'm not sure what to make of it. Though Coupland says that if a person asks,"What happens next?" then you've told a story. He certainly did that. Have a look at this video from Douglas Coupland's website. It's kinda long but very entertaining and includes fake ads for Solon and Channel 3 News and instructions on how to make an earth sandwich. Thank you to Random House for sending me this review copy. Wow, that's a cool premise. I hope I see this one pop up on my library shelves because I've never read Coupland. A world with bees hmmm ... stories about the future are always fun, so I may actually give this a read. Thanks for the review. That sounds scary because it sounds like something that could actually happen. I agree with bermuda- it seems quite possible we won't have bees around in some time! Scary. It seems such a small premise, but I am sure the book shows what huge consequences it would have. That in itself sounds interesting enough to have a go at. I've read some other Copeland & usually come away with this reaction -- but I pick up his next book when it comes out. Hadn't heard anything about Generation A. Thanks for the heads-up! I bought this book when it first came out, but I still haven't read it. I generally like him, so I am looking forward to it. I'm kind of on the fence like you. In fact, I'm reading a few reviews just now to see if anyone can push me in a particular direction. The ideas in the novels a good but I don't think they were particularly well realised, which was a disappointment.